ShippingEasy is a powerful tool for any ecommerce business that wants to streamline the shipping process while saving money on postage costs. Most ecommerce platforms are great for building product pages and accepting payments from customers, but they tend to fall short when it comes to shipping. Aside from providing a simple shipping calculator and address information, these platforms basically leave users to their own devices. ShippingEasy was designed to fill this void. This cloud-based shipping service is compatible with all major shipping carriers, including USPS, UPS, FedEx, and DHL, and it offers the kind of shipping rates that are typically only available to large-volume Fortune 500 companies. They’re known for their Commercial Plus Pricing, which allows online sellers to save up to 46% on all types of USPS shipping options, including Priority Mail, Flat Rate, Express, and International. They also offer Flat Rate Green shipping, which is calculated according to dimensions rather than weight. This is a potentially valuable shipping choice for sellers who offer products that are small and heavy. 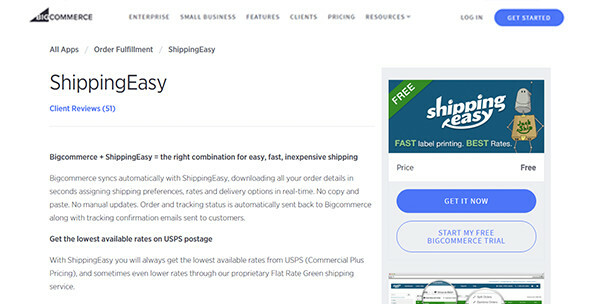 While the shipping discounts are reason enough to check out the 30-day free trial, there’s another compelling reason to consider ShippingEasy, and that’s the simplicity of it (hence the name). A user can plug in their FedEx or UPS account and then monitor all of their shipping options from one convenient screen. For sellers who use additional third-party shipping channels like Amazon and eBay, it’s easy to manage all cross-channel orders and shipments right from the ShippingEasy dashboard. Nothing ever gets lost or overlooked, and all necessary shipping labels can be printed at the click of a button. Although the layout of the app takes a bit of getting used to, the company offers live demos and training for all users. 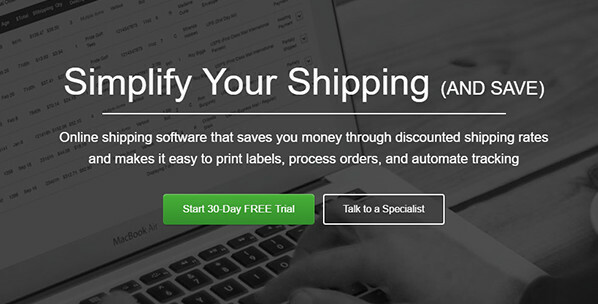 Within minutes, anyone can start managing their shipments and printing labels. Setup is a breeze since the app is designed to work seamlessly with dozens of leading shopping cart platforms like BigCommerce, Shopify, Volusion, Amazon Seller Central, Magento, 3dCart, and WooCommerce. For example, a BigCommerce user would simply proceed to their BigCommerce App Marketplace, search for “ShippingEasy,” and download the app into their existing shopping cart. Installation is that simple. One of the nice things about ShippingEasy is its flexibility. The platform is extremely customizable from the shipping options right down to the labels. Packing slips can be adjusted according to size and modified to include the user’s desired branding and information. The user can select from among numerous calculated shipping options or set their own custom shipping rates for specific products and order types. The customer management tools enable the user to create targeted email marketing campaigns for pre-selected batches of customers. 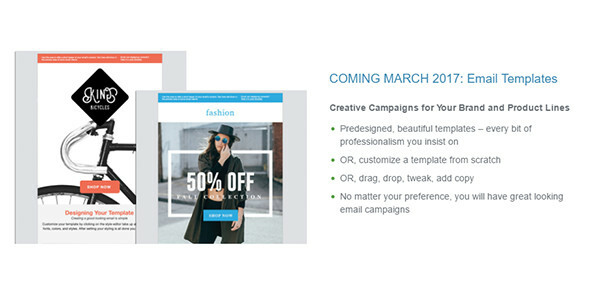 Each email message and each group of customers can be customized with its own unique email template. 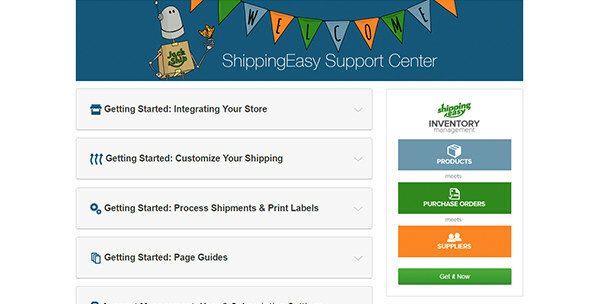 The customer management tools are currently included with the basic service, but ShippingEasy has suggested that they may soon begin charging extra for these features. Just be aware of that. Most users will choose from one of the five plans below. Once a user reaches 90% of their maximum order capacity in a given month, ShippingEasy will send them an email notifying them that they’re reaching their limit. The user can then upgrade their account to a higher membership level or face a shipping cap for the remainder of the payment period. For example, if a user at the free level reaches 45 of their allotted 50 shipments in a given month, ShippingEasy will send them a warning email. The user can then upgrade to the Basic plan, which will allow them to accept up to 500 orders. If they fail to upgrade and they reach 50 shipments, they won’t be able to process any more shipments through ShippingEasy until the next payment period begins. $0/mo. $29/mo. $49/mo. $69/mo. $99/mo. The Select and Premium memberships also include a dedicated account manager who’s available to answer questions, offer advice, and assist with configuring the shipping preferences and settings. For large businesses that process more than 6,000 shipments per month, ShippingEasy offers an Enterprise plan for $149. This plan includes unlimited shipments as well as extended support hours and additional enterprise features like multi-user logins, multi-location support, and free QuickBooks support. As previously noted, not all of the available features come standard. The biggest add-on is inventory management. This feature costs $14 per month at the Basic level, $19 at the Plus level, $29 at the Select level, and $49 at the Premium level. It’s not currently available at the Starter level. Using the inventory management menu, a store owner can add products, track inventory levels, and even create purchase orders. Granted, many shopping cart platforms already offer these features standard, so the inventory management module won’t be a wise investment for everyone. Still, some shopping carts are sorely lacking when it comes to inventory management (especially for users with multiple sales channels), and so there are instances when this added feature can be a godsend. The other notable add-on feature is the QuickBooks integration, which costs an additional $20 per month. The QuickBooks app allows users to import all of their order and sales data from ShippingEasy straight into QuickBooks. All data is automatically populated into the appropriate fields and calculated for simple financial accounting. Still, $20 per month seems a bit steep for this feature when you consider that a QuickBooks license itself is only $26.95 per month. Tracking information is essential for businesses that ship goods for a living. With ShippingEasy, a tracking number is automatically sent to buyers via email as soon as their shipping label is created. All tracking numbers are also stored in the user’s dashboard, so if there’s ever a dispute or concern, the store owner can immediately check to see the status of the shipment. ShippingEasy also offers the option of discounted shipping insurance. The user can set their preferences for optional or mandatory insurance, thereby protecting buyers (and themselves) in the event that an order is damaged or lost during shipment. ShippingEasy offers telephone support Monday through Friday, 8:30-5:30 Central Standard Time. Live chat is also available during these hours, and it can be accessed from within the application on any desktop or mobile device. Members at the Enterprise level have access to extended phone hours that last from 7 a.m. to 7 p.m. By calling before 8:30 a.m. or after 5:30 p.m., an Enterprise user can enjoy priority support with a shorter wait time. There’s also a helpful resource center with dozens of tutorials and guides that cover every facet of the software from setting up shipping preferences to creating email campaigns. New users can learn the ropes with the help of the company’s 1-on-1 live demos. Using a screen-share environment, an actual ShippingEasy employee guides the user through the setup process, demonstrating key features and answering questions along the way. This is a nice touch that’s rarely seen in the industry. 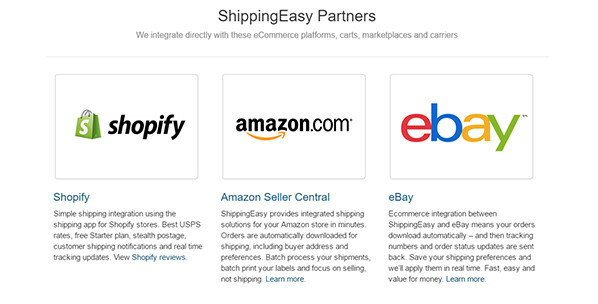 When coupled with a quality shopping cart platform, ShippingEasy is a powerful tool. It simplifies one of the most time-consuming and frustrating aspects of running an online business. Granted, there are less costly ways of printing shipping labels at home, but these services don’t offer the broad range of features or the valuable postage discounts that come standard with ShippingEasy. This application serves as a sort of personal assistant for shipping. The user need only print the label and send the package on its way. ShippingEasy takes care of everything else. The paid add-ons aren’t extremely impressive at this point. Most shopping carts already cover inventory management, and there are cheaper ways to import sales data into QuickBooks. Nevertheless, ShippingEasy comes equipped with enough native shipping features to benefit most high-volume sellers. ShippingEasy was founded in Sydney, Australia, in 2012. The company is now headquartered in Austin, TX, where it employs more than 50 employees and supports more than 20,000 online stores located all across the world. ShippingEasy is a cloud-based service that prides itself on offering the lowest USPS rates in the industry while also supporting a range of other leading carriers including UPS and FedEx.